Here at Taste the Cracklin, we’re busy getting ready for the party season. There’s always plenty happening all year round, from Easter events, summer fun days, through to Halloween and bonfire night and the festive season. There really is no reason why a hog roast cannot become the excuse for having a party, just so you get to eat all of this delicious food again and again. The great thing about having a hog roast, is that they compliment pretty much any kind of party from corporate events to formal sit down meals and anything in between. Certainly all our clients past and present have been very impressed not only with the quality of their meal, but with the ease and lack of fuss with which we can create an impressive meal or BBQ! It’s a recurring theme for us and one we’re really proud of. So we’ve been busy visiting the local farms where we source all our produce. Great quality food is something that’s really important to us as we’re sure it is to you, and this is why we work very closely with our suppliers to buy local, organic produce. By doing this we can not only pass on great quality to you, we can support our local agriculture and keep costs as low as possible: we think it’s a winning formula all round! Taste the Cracklin in Poole, is becoming very well known to the surrounding farmers; hopefully the pigs don’t recognise us or we’d never catch them though! It’s a bit like a medieval banquet and with all the trimmings it lends that bit of extra theatrical fun! When you see a whole roasted pig, all caramel coloured and rotating slowly on the spit it’s a feast for the eyes not just the stomach. We would really challenge anyone to come forward if they have ever tasted anything as delicious as a floured roll crammed full of our delicious, tender cuts of pork with lashings of herby stuffing and tangy apple sauce all prepared by our chefs on the day. We don’t think there’s anything better on a cold winter’s night and we’re equally sure you’ll agree! Of course, cuts of hog roast cooked meats which melt in the mouth, all served in rolls is just one of our very varied menus and we can tailor our services to exactly fit your planned event. If you are organising a formal sit down dinner, our fully trained serving staff will come along and wait on your guests professionally and politely while you enjoy your company and food. We will also clear everything away discretely at the end of the meal, leaving your venue as we found it. And of course wherever we cater we take our talented chefs who will roast to perfection your choice of meats and prepare freshly for you, your choice of accompanying dishes. It’s really good to have something in your life you feel passionately about and for us that thing is hog roasting, is that it’s a fantastic way to make great tasting and nutritious food at a great price. Roasting a hog is not only great fun to do, especially with our specialised ovens, but it’s a great way to feed a large number of people with tasty, hunger satisfying food. We have a number of ovens available to hire for your own events. While the machines vary in size and style, the one thing they all have in common is that they have been designed by hog roasters for hog roasters and this is why we know we are providing the very best machines on the market! 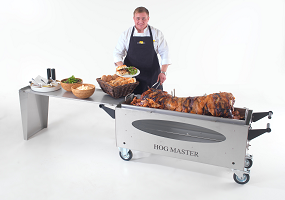 All of our hog roasting ovens are built from tough stainless steel. this makes them not only easy to maintain and clean but gives them a pleasing look too. our machines are all gas powered which makes roasting large joints of meat so much easier. Once you have the pig or lamb securely in place on the spit roast skewer, the fully motorised rotor will continuously turn the meat so you get a nice even finish. Whether you would like to contact us about catering for your event, or would like further information about hiring a machine for you to be able to cook at your own event. You can contact us by telephone or through the contact form on the website.